Sign up now to start getting feedback. Easy setup in under 20 seconds. The problem with breakroom suggestion boxes is that they can go unchecked for ages. With Improovi, you're notified every time someone submits a response. ● Improve your processes by making idea generation a routine part of your business. ● Teammates that belong to a box can view that box's responses. ● Ideas are top of mind thanks to automatic emails to you & your team. 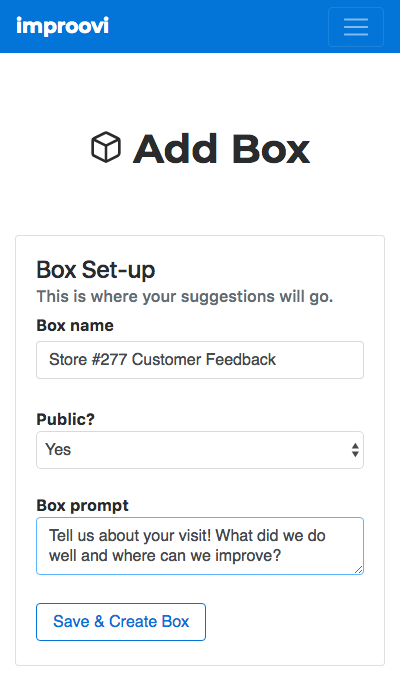 Create a box for each department and product/service that you offer. Send to your customers or employees to start getting feedback. 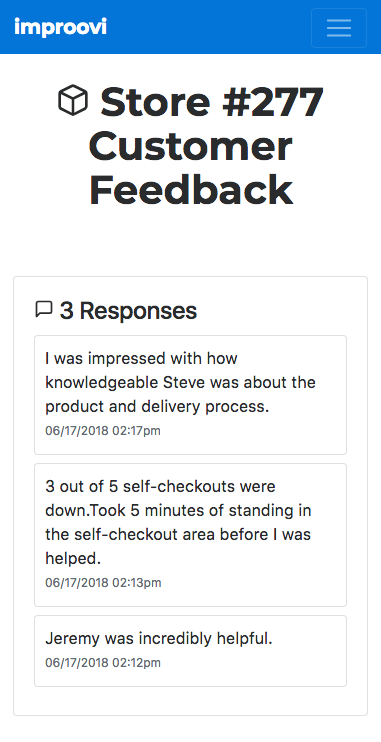 ● Get product-specific feedback from customers. ● Create boxes for internal projects. ● Collect feedback from one-time events. Protected by 256-bit SSL encryption. 30-day money back guarantee. ● Only employees with access to boxes you specify can see responses. ● Delete boxes and/or suggestions at any time if needed. ● You have full controll over who has access to which boxes. Improovi will send you an email each time you get a new response. ● Get product-specific feedback from & customers. Amazon Prime was born out of Amazon's early employee suggestion program. These customers increased their purchase rate by over 150% after joining Prime. ● Work on experimental ideas.